You are cordially invited to join us as we honor the newly selected Jurisdictional Officers and recipients of the DeMolay Legion of Honor. These events will be hosted at the beautiful St. Louis Scottish Rite Cathedral. The selection to be a Jurisdictional Officer in Missouri DeMolay is a privilege and an honor made by the recommendations by peers of the young men. 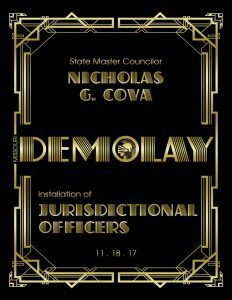 It is this very process that sets Missouri DeMolay apart from the rest of DeMolay International and provides a strong foundation for the successes of Missouri DeMolay. Reception & dance immediately following until 11:00pm.